The Plaid Cymru annual conference, meeting on the weekend of 14th-15th September, has passed an emergency motion calling for the immediate release of Abdullah Ocalan, an end to Turkish military operations and the resumption of peace talks between Turkey and the Kurds. This is the first time that a leading British political party has formally adopted such a clear motion demanding for the release of Abdullah Ocalan and his involvement in peace talks. The motion, drawn up in cooperation with the Peace in Kurdistan campaign, was moved by MP Hywel Williams, a longstanding supporter of the rights of the Kurds, and received overwhelming backing from the conference delegates. Plaid Cymru, the Party of Wales, formerly the ‘Welsh National Party’, is the third largest political party in Wales and has for long been in support of justice for the Kurds. Plaid Cymru representatives in Cardiff, Westminster and Brussels have lent their support to initiatives seeking to raise the Kurdish issue and have taken part in delegations to Kurdistan on numerous occasions. Peace in Kurdistan along with Kurdish diplomatic representatives from the Kurdistan National Congress, KNK, have lobbied Plaid Cymru and attended its conferences over many years developing close relations with the party which has ensured that Plaid members have been kept well informed of developments in Turkey and Kurdistan. 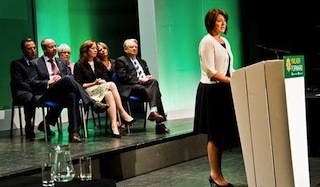 This year’s conference held in the town of Brecon in mid-Wales was attended by AKif Wan, KNK representative, accompanied by David Morgan from Peace in Kurdistan, who were able to meet with senior party members including president Jill Evans MEP, former president Dafydd Iwan, Elfyn LLwyd MP, and the new party leader Leanne Wood. Plaid Cymru friends were thanked for their continuing support and for the warm welcome they always give to Kurdish representatives visiting their conferences. The visit gave an opportunity to raise with Plaid Cymru the latest news on the mass show trials of journalists, lawyers in Turkey and the continued persecution of the pro-Kurdish BDP by the state. The party also has strong sympathies with the Kurdish struggle for national rights and self-determination given its own traditions and perspectives on the history of Wales and its relations with Westminster.